They arrived wearing tuxedos and evening gowns, under an arch of military sabers. They got their hair and makeup done and shoes shined, and walked through a row of paparazzi on the red carpet. They got pictures taken in front of a balloon arch. They enjoyed dinner, sang karaoke and danced long past the appointed hour; some got their first rides in a limousine. Kansas Wesleyan’s Student Activities Center was one of 537 locations on Feb. 9 for “A Night to Shine,” a prom for individuals 14 and older with intellectual disabilities. Salina Church of the Cross United Methodist Church was the local host for the evening, which put 110 guests in the spotlight. “We’re just so excited,” said Marti Higdon, the church’s director of youth and children’s ministries. Higdon said she got the idea to support the Salina version from church friends who had children in the Special Olympics. “I just knew that this was a way we could spread love to people in Salina that don’t always get to see it,” she said. Higdon approached the Rev. Loren Drummond, Church of the Cross pastor, with the idea last spring. Drummond said he was amazed at the packed student center, where each guest had a “buddy” – many of them Kansas Wesleyan students – who accompanied them throughout the night. “There’s so many things I see tonight that just melt my heart,” he said. “A Night to Shine” is a concept from the Tim Tebow Foundation, started by the college football Heisman Trophy winner and former NFL quarterback. In a video presentation between the dinner and dancing, Tebow told those attending that they were all the kings and queens of the prom. Although there were prescribed rules for the “Night to Shine,” each event could add its own personalized touches. At Salina, guests at both doors walked in under a saber arch provided by St. John’s Military School. Guests also got to take turns riding in a limo around Salina. Their finery was provided by donations of evening gowns, suits and tuxedos to the church. A local beauty academy gave makeovers to the females, and the males got their shoes touched up in an old-time shoeshine stand. Parents of the youth and young adults were impressed with what they saw. It also had an impact on the “buddies” who were either paired up with their guests at the event or attended as friends. 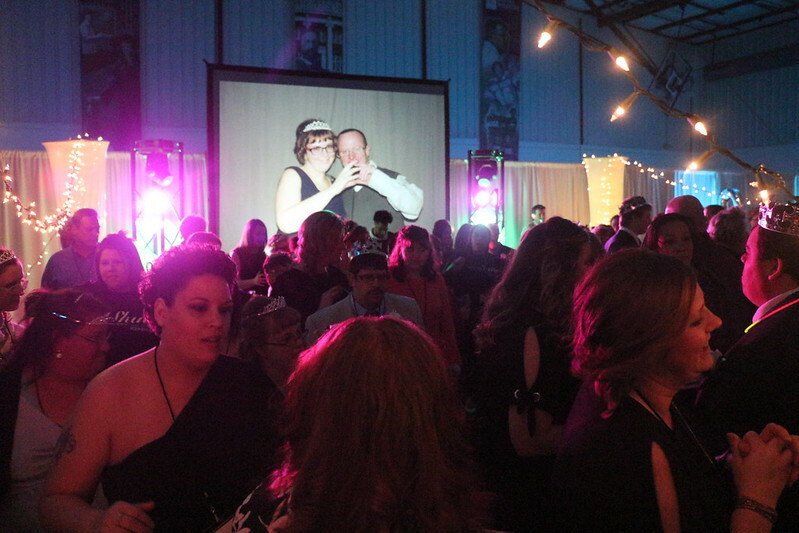 An announcement from Higdon and Drummond in the middle of the dance, to the cheers of the crowd, was that the event would return to Salina for a second year in 2019.